The 8th Annual Brooklyn Hip Hop Festival was headlined by Busta Rhymes and was covered by the Noisemaker Media crew under the leadership of Director Mark Carranceja. Enjoy uninterrupted coverage and be privy to front row seating at one of Hip Hop's most memorable on-stage reunions ever as Busta Rhymes is joined by A Tribe Called Quest and Leaders of the New School for the first performance of their seminal classic collaboration "Scenario." In addition, watch Slick Rick rock the seminal "Children's Story," Black Moon's Buckshot enters the stage to perform "How Many Emcees" & "I Gotcha Opin", Smif-N-Wessun blast the indelible "Sound Bwoy Bureill," and M.O.P. drop the all-time street anthem "Ante Up." 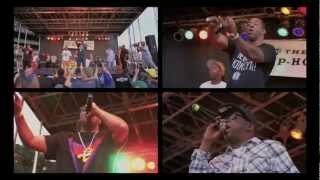 Busta Rhymes & Friends || 2012 Brooklyn Hip Hop Festival [FULL SET] || Dir: @noisemakermedia. Smith and Zeizel began dating after the pair met on the set of one of the pop star's video shoots late last year. Head over to Zeizel's Instagram for more romantic moments between the happy couple.